Time to level up, gang. In this post introducing design thinking and Human-Centered Design, we dove right into the first stage of Empathize. We talked about how to better understand the problems, needs, and opportunities of your intended beneficiaries with methods like those in IDEO’s DesignKit and by utilizing the Value Proposition Canvas. Once you’ve immersed yourself in the experiences of your target market, you’ll probably have a lot of data. What do you do next? Time to turn that raw data into information you can use to add value to those people’s lives. I’m a creature of habit. I actually enjoy eating the same foods regularly (it took me this long to find the perfect ones! ), exercising on the same trails (the exact right trails! ), and wearing the same clothes (these ones make me look good!). I’m definitely a maximizer, and my friends and family find all this very amusing. I’m just grateful they put up with it. Despite all these habits I’ve accumulated, there are still some that I would like to change. I’d like to read and write more in place of Netflix binges. I’d like to lay off the sugar. Bringing some diversity into my exercise regimen would probably be beneficial. Enter Charles Duhigg’s book, The Power of Habit. The book lays out the science behind habits and what we can do to gain our power back over them. Continue reading The. Business. Model. To create products and services that meet the needs of people, it’s important to keep track of your target market’s pains, gains, and to-do’s – which are all opportunities for providing value to them. It’s hard to turn a corner in the world of social innovation and entrepreneurship without hearing about the design thinking process. If you’re thinking about creating a start-up, product, service, or anything really, this process can be a game-changer. What is design thinking, exactly? Design thinking is a process for innovating solutions to problems. It’s a methodology for creative action that begins with learning directly from the people you’re designing for, identifying opportunities, and prototyping possible solutions for feedback, and then bringing viable solutions to market. Within the steps of Empathize, Define, Ideate, Prototype, and Test, practitioners can identify the right problems, ask appropriate questions, generate more ideas, and select the best answers. Stanford’s d.school offers a free 90-minute virtual crash course on this methodology. In 2009, IDEO launched the Human-Centered Design Toolkit, which provides tools, methods, and guidance on the design thinking process for innovators who are designing for human beings. Which, technically, should be all innovators. We all need a pep talk sometimes. Like those times when you are having trouble forcing yourself to make a decision, get started, get unstuck, etc. If you haven’t seen this yet, I don’t know what you’re waiting for. Social entrepreneurs and innovators are creative. We are literally creating things, which makes us creative by definition. The problem with creativity is that it is not a permanent state. Sometimes you need a pep talk to give yourself the inspiration you need to get going. Over the past several weeks, I’ve been researching possible structures for social enterprises, and writing about how to pick the right one for your organization. The post grew and grew, so I’ve decided to turn it into a short ebook, which I’ll be releasing here soon! For years, the delineation between non-profits and for-profits has been dissolving. Social enterprises are testimony to this societal transformation—they demonstrate how profit and mission need not be mutually exclusive. But each social entrepreneur is faced with a critical decision point along their journey: to be (or not to be) legally designated as a non-profit, a for-profit, or potentially a hybrid of the two. An organization’s legal structure refers to its governance, legal form, and ownership. It influences how an organization can make money, the kinds of activities it can undertake, and how the government will tax the organization. The wrong structure can put the organization at financial and legal risk, so it should be considered and chosen carefully to fit the organization’s needs. 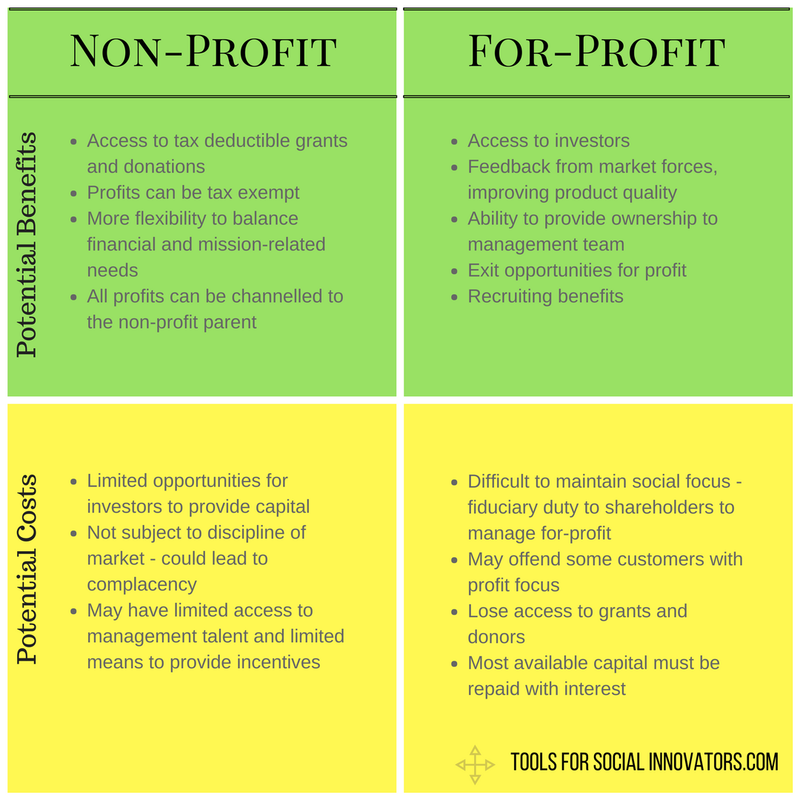 The chart above provides some basic guidance on the advantages and challenges of for-profit and non-profit structures. More information on each, as well as guidance on a third option—a hybrid between the two—are included in the ebook that will be coming soon! In the first post about how to undertake social innovation (“Start Here.“), I wrote about the importance of starting with a problem, as opposed to jumping right in with a solution. Why is this the case? Many projects intended to help people have failed in spectacular ways. Click here to learn more about failed aid projects (there are many). These initiatives frequently fail because they rest on assumptions about the people they’re supposedly helping. Even if the project is carried out as intended, if the base assumptions are wrong, then the project can have major unintended consequences. To avoid these kinds of blunders, it’s best to be conscientious about selecting the right problems to address. But with so many worthwhile problems to address in the world, how do you pick one? While a great deal of the guidance out there will tell you what to do once you know the issue that you’ll be addressing, there’s not a whole lot out there that explains how to narrow down the field of options to a problem that’s really worth your time. This may seem like an obvious selection to some of you out there (“Just pick one!” you might say), but here’s a little known secret: the problem you focus on will ultimately determine your level of success. A well-defined problem often contains its own solution within it and the innovators who are truly taking things to the next level are the ones who are identifying those well-defined problems. The following resources will help you to be one of those innovators. 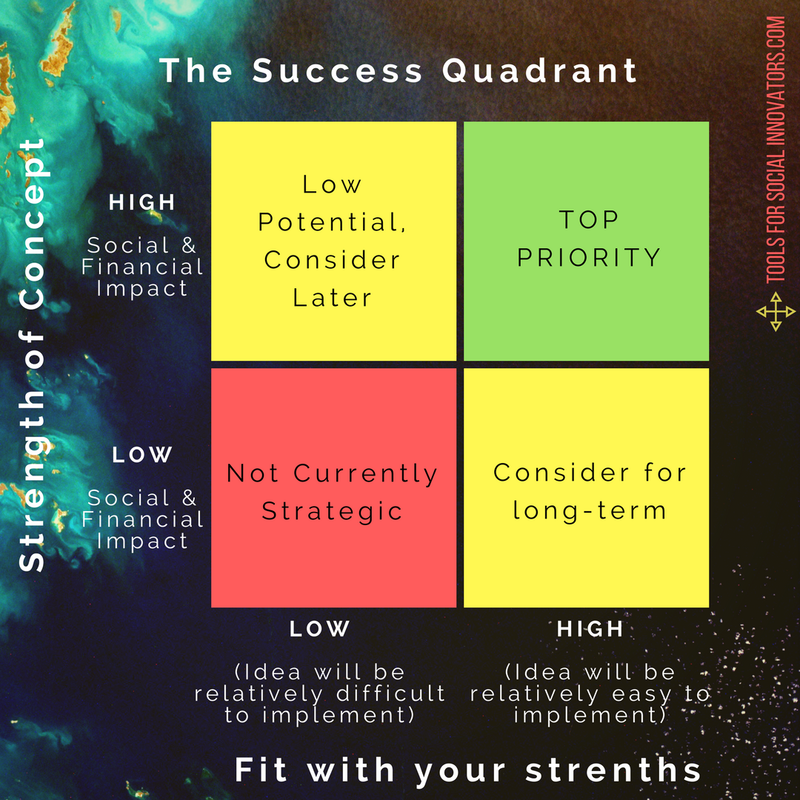 The chart above can help you prioritize issue areas by those that have high social and financial impacts (you want to make a difference and be able to financially sustain your efforts) and that also play to your strengths. For example, if I’m interested in addressing climate change on some level, I should start brainstorming ways in which I can use my unique skills and strengths to make a difference. It would be harder for me to go back to school to become a scientist, but maybe I could help in a communications or policy role. Of course, if I really want to become a scientist, that’s allowed—you can always build upon your skills and strengths. Brainstorming in this way can be helpful for identifying issue areas that make sense to pursue further. What specific problem are you interested in addressing? What stakeholders are affected by the problem or might be affected by its solution? Who are your intended beneficiaries? What has been done to address the problem already? Are there gaps? What would the ideal world be in the absence of the problem? When you’re looking into problems, you’ll most likely want to better understand the root cause of the problem, as opposed to focusing on symptoms of the problem. 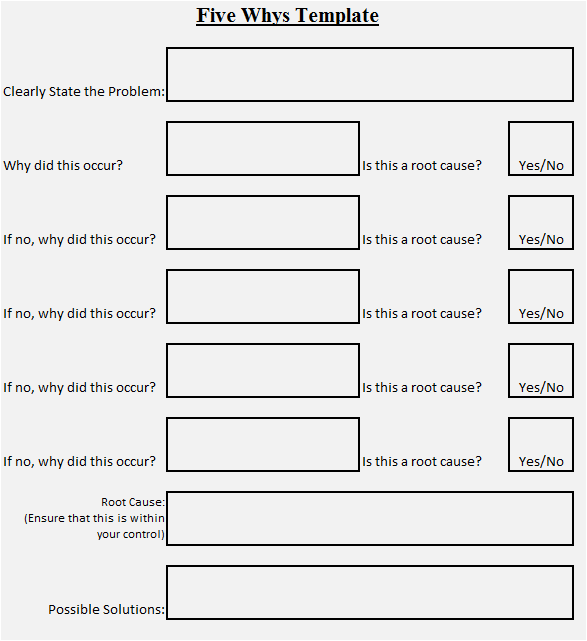 To get to root causes of problems, Toyota famously created the “Five Why’s” technique in the chart below for their Six Sigma process improvement program. You can use as many why’s as you need to get to the source problem, so don’t feel limited to five. Once you have an idea of the field you want to go into, then utilizing the design thinking process is a great next step. I’ll talk more about the design thinking process in the next innovation post, but, overall, it has five stages: Empathize, Define, Ideate, Prototype and Test. Within that first step of Empathize, you’ll embed yourself in the world of the problem to discover key insights from those who are affected by the problem. These stages will help you further refine the problem, ask the right questions, develop more ideas, and select the best solutions. Hi there. 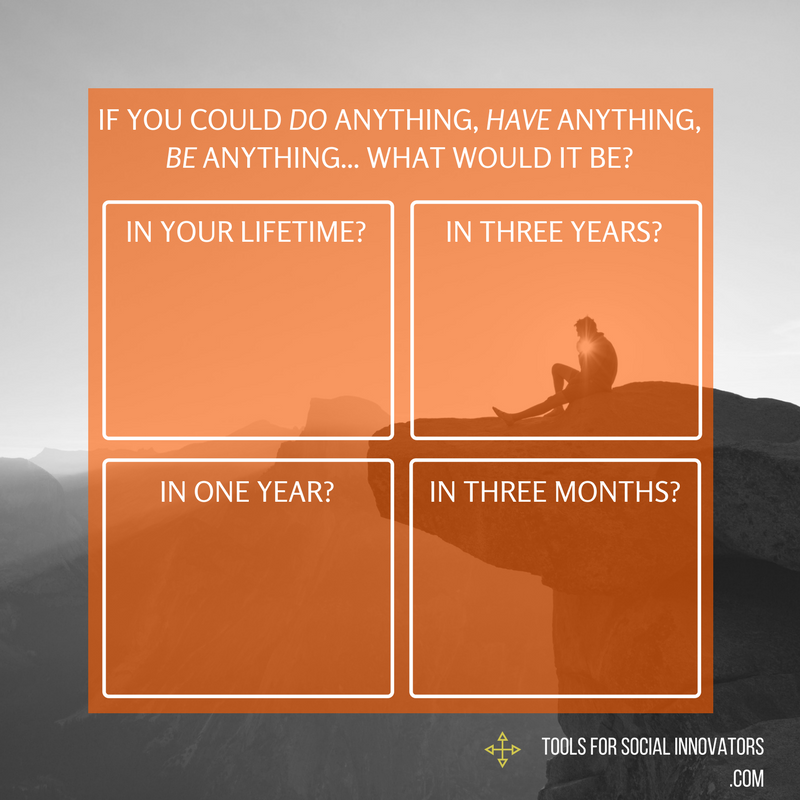 So, I recently attended a conference for social innovators where the following exercise for goal prioritization was introduced. I found it truly helpful for sorting out my passions and priorities, so I thought I’d create a couple charts to illustrate the exercise and share them here with you all. This chart helps you break down your life goals into shorter time scales so that you can see how to start tackling them. This exercise works best if you have an accountability partner! Let someone close to you know your goals for the next three months and schedule a call or meeting with them after three months to check in on your progress. 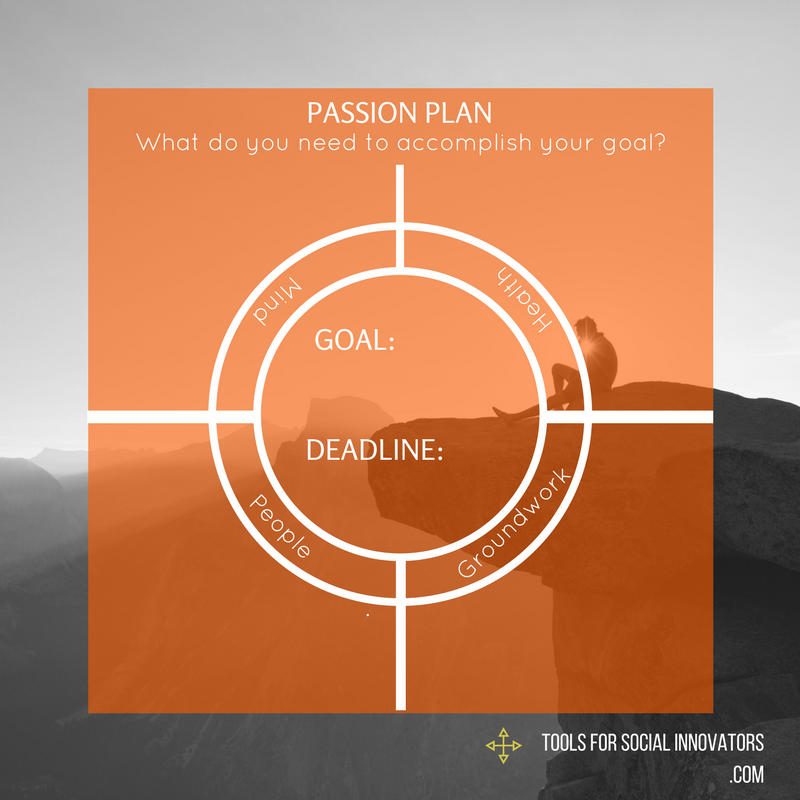 Once you have some goals identified from the passion mapping exercise, you can use the Passion Plan to chart out what you think you’ll need to go after those goals. I’ve divided the chart into People, Mind, Health, and Groundwork, but you may want to add other sections. If you bring over the deadline from the passion map for the specific goal you’re investigating, in addition to writing it in your calendar, it works all the better. Feel free to use and share these charts. Please leave a comment below if you have other methods that you find helpful for sorting out your priorities and tackling big goals.